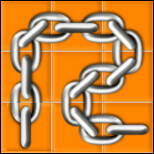 Chain Gang is a puzzle where you connect links of chain into a complete chain! It may look hard, but it really isn't! Let's start with the basics. When you play Chain Gang you'll be in a room with up to four other players. 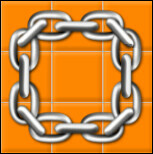 Each person has their own board (a 3x3 grid) for the chain links. To get links just click "Spin" or hit the Enter key! There are three different types of links that you can get. You can move links around by clicking on a piece and dragging it to a new spot. 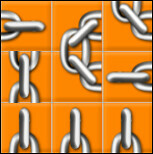 You can't rotate the links, so you'll need to do some thinking in order to complete a chain. How do you complete a chain? Oh! It's pretty easy. A finished chain needs to have two end pieces connected together OR you can make a loop by using curved links! As long as there isn't half a link just dangling out there, the chain is complete! 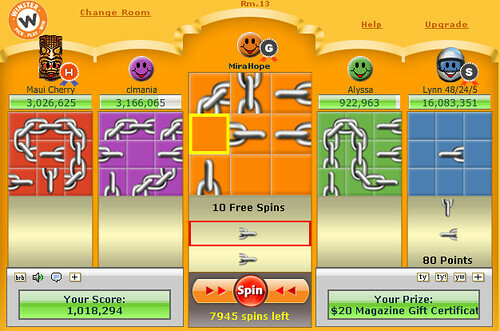 To save spins, you'll probably want to trade for any last links that you need. Click on the piece you want to trade away and drag it to the piece that you want. Your teammate will see a Yes/No balloon pop up! If they pick "Yes," the pieces will switch places! On the other hand, if a teammate sends you a trade, then you'll see the Yes/No balloon. You don't have to trade if you don't want to, but it's a great way to make bigger chains and earn more points! 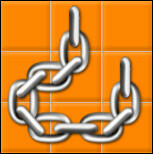 Longer chains are worth more points, so make them as long as you can! In the table below there are examples of different chain lengths. Please remember that these are only examples! There are many ways to create chains! Oh! And don't forget that Club Winster members get four times the points too! Long chains are great, but sometimes you need to make small chains just to make room. If you have oodles of end chains, put two together for a quick 2-link chain. 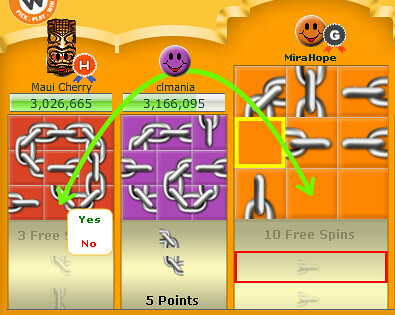 Don't waste 30 spins if you're not even close to a 9-link chain! As soon as you make a chain that forms a loop OR has two end links, Chain Gang automatically submits it to Winster for points. No "Cash In" button needed! The one downside is that it's very easy to make a complete chain on accident. Most of the time it isn't a big deal, but it can be frustrating when you're trying to build a long chain and whoops! There go three of your links! When you have a blank board and are just spinning to get pieces, start by putting the end links against the edges. In the picture below there are five end links but they all "dead end" on an edge! You'd want to trade or spin some of those end links later, but this is a good starting place. As you shape the chain, keep creating dead ends so you don't accidentally finish it too soon. 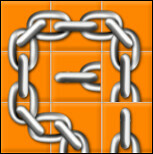 You can also "block" a chain by adding a link that faces the wrong direction. 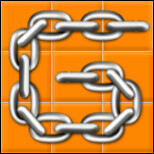 Here we have a 6-link chain and one end leads to nothing while the other end is blocked by a reverse link. You could trade or spin any of the three extra pieces and no matter what you got in return, it wouldn't complete the chain. Once you have the end pieces you need, just switch them and get your points! 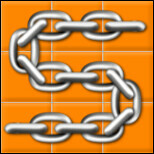 A 9-link chain is the longest chain possible. But sometimes when all you have is a board full of jumbled links it looks so confusing! Well, if you want to build a 9-link chain, just remember the Solid Gold Rule. S, G, and R are the three 9-link patterns! It might be flipped around or rotated, but you can find one of these letters in every 9-link chain. Take time to look at these patterns and check out the different links each one uses. If you have lots of corner/curved links then you should opt for the R pattern. Have three straight links all in the same direction? Go for an S! 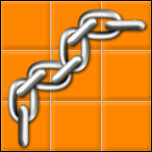 Once you know what to look for you'll have a much easier time building 9-link chains. Well, that's everything! You've learned all there is to know, so go try Chain Gang!